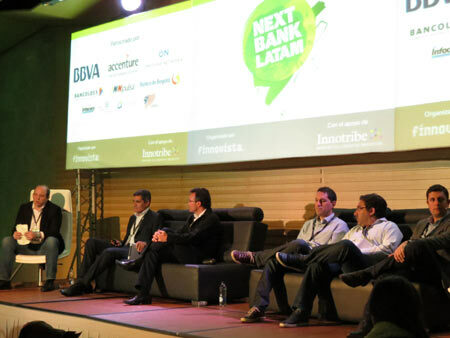 The inaugural Next Bank Latam event took place November 21-22 in Bogotá, Colombia. At the international conference more than 20 speakers, all of whom were recognized international and regional thought leaders, brought together an audience of more than 230 professionals, including bankers, consultants, entrepreneurs and investors, and discussed collaborative innovation in financial services. Attendees debated the profound need for transformation in the financial services sector driven by new technologies and new digital lifestyles adopted by broad segments of the population. It was confirmed that these changes have brought about an important challenge for traditional players in the region and an excellent opportunity to increase financial inclusion for the population in Latin America, where more than 250 million people do not have access to financial services. In his inaugural keynote, Diego Molano Vega, Colombia’s Minister of Information Technologies and Communications, after sharing a report on the improved digital infrastructure and the diminishing digital divide in Colombia, made a call to action to Colombia’s financial services industry to invest in innovation and entrepreneurship, arguing that without this, the country will not be able to innovate or offer basic financial services to broad segments of the population. Banking for the masses – The banking sector, which has traditionally been conservative, must consider new alternatives for growth, innovating with new technologies and new business models that will drive financial inclusion among broad segments of the population. Notwithstanding, banks are not alone, as entrepreneurs and SMEs are already playing a key role using technologies to bring financial services to everyone. People-driven financial services – Banks have not yet adapted to the new needs and demands of their customers, particularly new generations who have adopted digital lifestyles and reject traditional processes still prevalent in the financial services sector today. The challenge for banks lies in using technology and innovation to create new experiences and solutions that generate value for the customer and address today’s problems. Collaborative trinomial: Banks, Entrepreneurs and Venture Capital – Experts attending the conference also highlighted how technology is driving structural change in the financial services industry, allowing startups to enter the market by focusing on providing solutions to real-life problems which banks are not addressing. As a response, banks in the region are beginning to approach startup ecosystems through specific actions such as collaborations and joint product and service designs, or through direct investment in startups together with venture capital funds. Although the conference has already finished, the dialogue addressing transformation in the sector will continue online at www.finnovar.com where presentations and videos from the event will be posted.